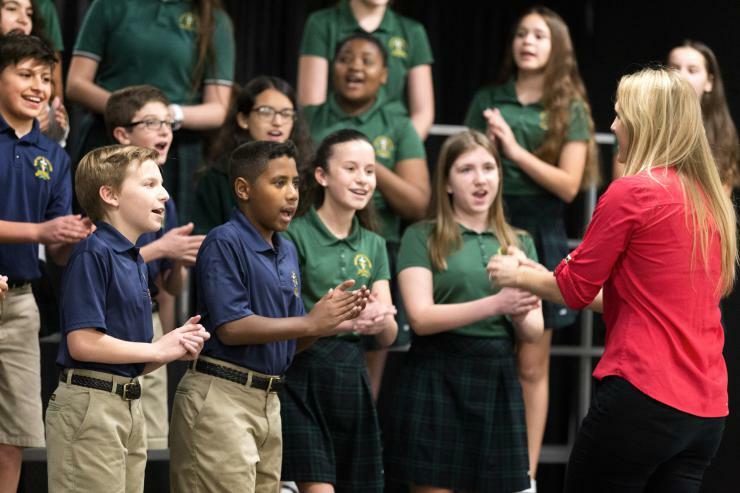 Music director Susan Calderalo leads the student choir at the opening of Mary Help of Christians Catholic School Parish & Student Center in Parkland. Miami Archbishop Thomas Wenski blessed the facilities serving northwestern Broward County during a ribbon cutting ceremony March 4. Miami Archbishop Thomas Wenski blesses the new parish and student center facilities at Mary Help of Christians Parish in Parkland, serving northwestern Broward County. The event was held March 4. Students, family and friends look on during the blessing and opening of Mary Help of Christians Catholic School Parish & Student Center in Parkland. 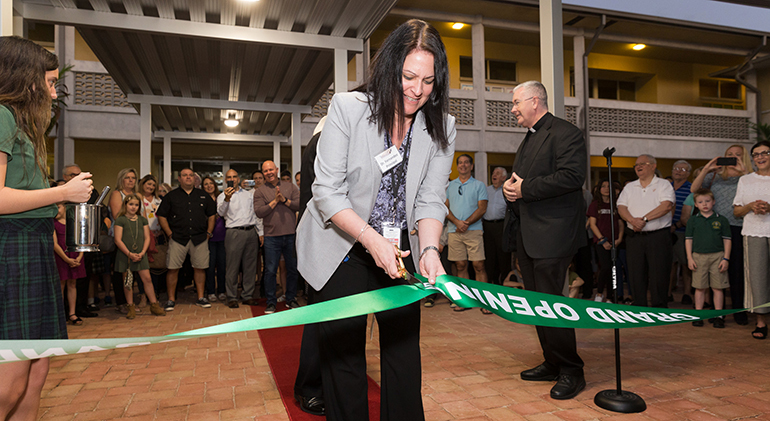 Alexandra Fernandez, principal, cuts the ribbon March 4 during the official blessing and opening of Mary Help of Christians Catholic School Parish & Student Center in Parkland. 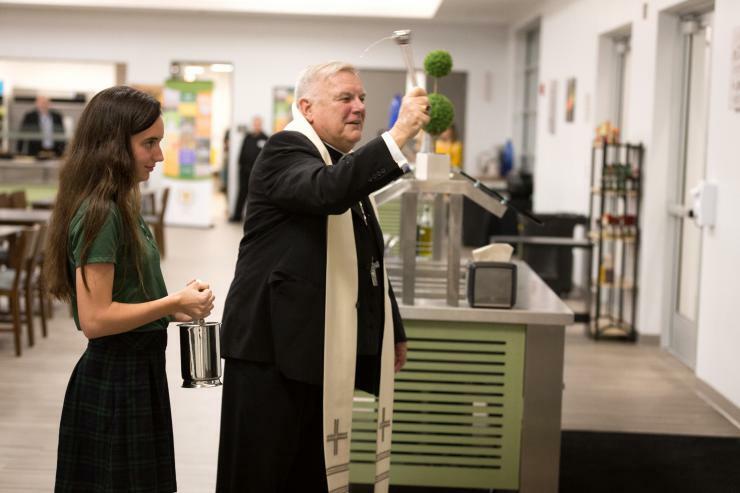 Miami Archbishop Thomas Wenski blesses the new parish and student center facilities at Mary Help of Christians Parish in Parkland, March 4. Msgr. 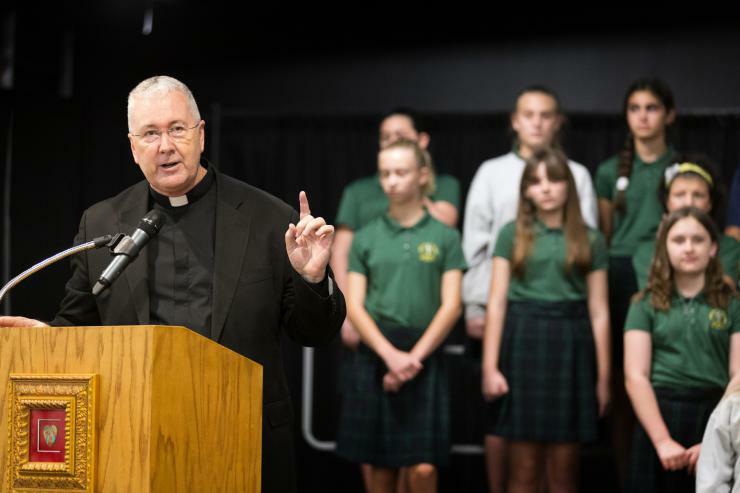 Terence Hogan, pastor, speaks at the blessing of the new parish and student center facilities at Mary Help of Christians Parish in Parkland, March 4. 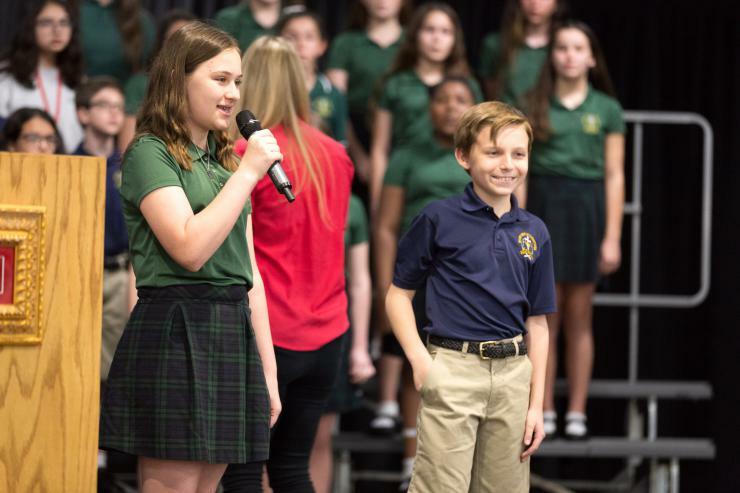 Students Chloe Berg and Jack Radpsevich sing for Miami Archbishop Thomas Wenski during the blessing of the new parish and student center facilities at Mary Help of Christians Parish in Parkland, March 4. 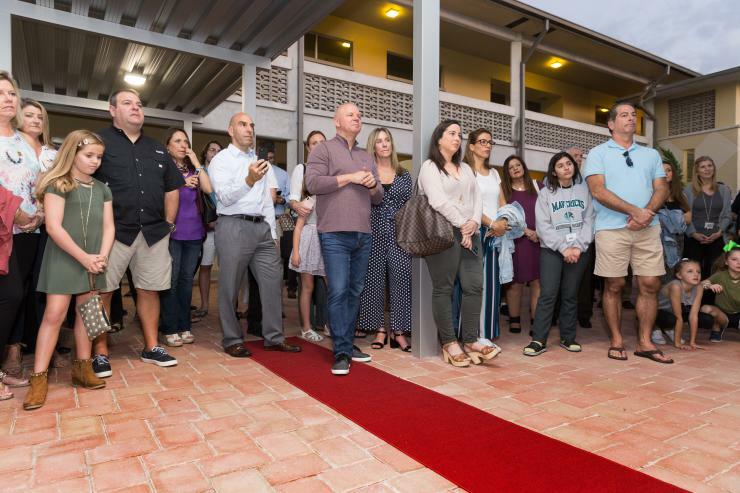 PARKLAND | Alexandra Fernandez, principal of Mary Help of Christians School in northwestern Broward County, notes that the newly dedicated parish and student center now serves as a state-of-the-art cafeteria and much more. “We used it Feb. 14 for the prayer vigil” marking the one-year anniversary of the Parkland shooting tragedy nearby, Fernandez told the Florida Catholic, adding that the 15,000-feet structure allows some 600 people to dine in cafeteria mode, but can accommodate 745 as an auditorium with a stage area for special events. The new $3.2 million facility allows students to eat lunch indoors comfortably, and provides additional space for administrative offices and classrooms. A new school food service provided by Sage Dining Services also moves Mary Help of Christians into an inclusive model in which students can access the cafeteria daily as part of their tuition structure, without a la carte meal fees. 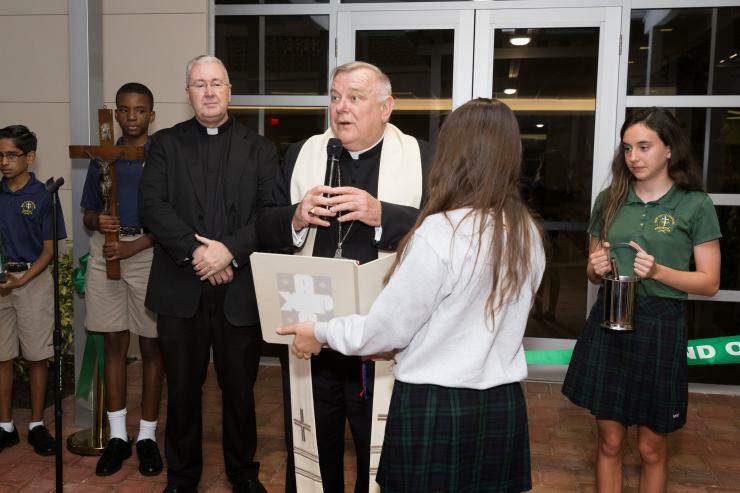 Miami Archbishop Thomas Wenski blesses the new parish and student center facilities at Mary Help of Christians Parish in Parkland, serving northwestern Broward County. The event was held March 4. On March 4, Miami Archbishop Thomas Wenski blessed the new facility during a community event replete with a performance from the school choir and homemade goodies from the new state-of-the-art kitchen. Msgr. Terence Hogan, pastor of Mary Help of Christians, was on hand along with several community and civic leaders who have been active in the project for the last few years. The complex includes high-efficiency lighting and air conditioning equipment, along with energy efficient and high-tech roofing, windows and flooring materials, according to David Prada, senior director of building and properties for the Archdiocese of Miami. The new building was designed to create multifunctional spaces that double as music classroom and band area, and a new grassy area called the plaza has been created to serve as a gathering place situated between the new and old buildings. 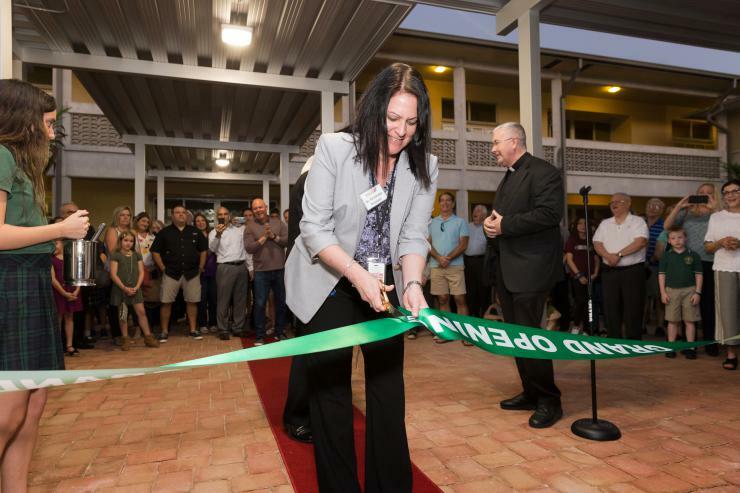 Alexandra Fernandez, principal, cuts the ribbon March 4 during the official blessing and opening of Mary Help of Christians Catholic School Parish & Student Center in Parkland. Miami Archbishop Thomas Wenski blessed the facilities serving northwestern Broward County during a ribbon cutting ceremony.